Yes, I am still here. I am sorry I haven't posted anything new recently! I have been cooking, I just haven't had time to post on the blog! I have a small photography business, and I am slammed! Combine that with three busy kids, homeschooling, and everything else life throws at us, the blog took a vacation. =) This was so good! I actually used canned crab, so I can't even imagine how good this would be with fresh crab! My kids loved it too. I served it over fettuccine, but you could use any pasta. Heat butter in a large pan over medium heat. Add the garlic and red pepper flakes. Saute until it becomes golden and fragrant, about 1 minute. Add the diced tomato, salt, pepper, and brown sugar. Cook for about 8 minutes, until the tomatoes begin to create a light sauce. Add in the cream and bring to a boil. When it starts to boil, turn the heat down to medium-low and add the sweet peas, Parmesan, and parsley. Stir and let it thicken for about 8 minutes. While it is simmering, cook the pasta. Mix in the crab meat and heat through, about 2 minutes. 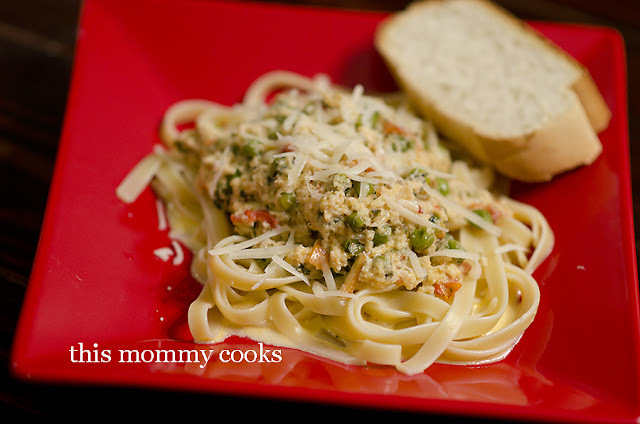 Top your cooked pasta with the crab mixture. Serve topped with freshly grated Parmesan cheese and lemon zest.